This Post has already been read 1759 times. 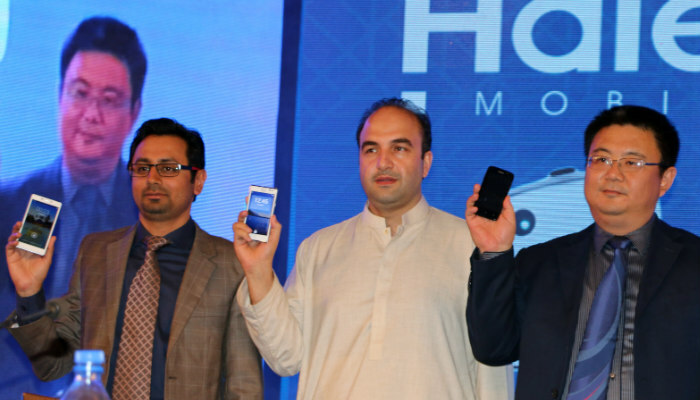 Haier Pakistan recently organized an event to launch new mobile phones in Pakistan. The event was held in Lahore at Royal Palm Golf and Country Club. At the event Haier launched 15 new smartphones and featured phones in Pakistan. The event was hosted by Ruba SEZ Group. At the launch of Haier Mobile President of Ruba SEZ Group announced the latest venture ‘Haier Mobile’ as well. On this occasion the President of Ruba-SEZ Group Mr. Shah Fasial Afridi passionately described his aims to take the Group to new level of pride with even a greater ambition. This new venture led by him aims to provide quality Mobile Phone products at affordable price to the masses, creating a distinctive statement. Ruba SEZ, for over a period of more than 13 years, has partnered with numerous highly reputable and internationally renowned companies from all over China including, but not limited to the likes of Haier, Opple Lighting, Real Force Group, Metallurgical Group Corporation, Shifeng Group, and most recently Jomoo Group. Furthermore, their specialist knowledge, experience and expertise with regards to the Pakistani economy, when coupled with their long heritage of excellence, helps solidify the confidence of investors from not only China, but all over the world as well. According to Mr. Afridi Haier Mobile vision is to deliver accessible technology, and become pillar of growth for the nation. Also present at the event was CEO Haier Mobile Mr. Zeshan Qureshi who took great pride in announcing the launch of Haier mobiles phone range. He sees Haier Mobile as a force to be reckoned with. According to him Haier is already a brand which has made waves in the electronic-world, worldwide with the right mix of products. The product range of Haier Mobile is crafted to perfection. The full range consists of three tier Klassic, Pursuit, and Esteem are brilliantly designed for Pakistani market as they cater to every segment seamlessly. The chief guest of the evening Mr. Zhangzhong CEO Qingdao Haier Telecom Co. Ltd graced the event with his presence on this grand occasion. In Pakistan Haier not only delivered quality but also insured after-sales that became a bench-mark in the Pakistan after-sales service. Haier appliances are ranked among the top home appliances brand across the nation and throughout the globe. With both the heavy weights joining hands together in the hand set sector we hope to see an upwards economic trend in the country.